Everyone could do with a little help or a hint now and then, and with the newest update, Advanced Training makes its way into the game. This means those of you struggling with a specific aspect of World of Tanks can consult the in-game menu. Also, if you’re relatively new around here, make sure to check out our Chained Missions, which will teach you the basics and help you improve your tanker skills. These are some little extra applied lessons that help your development from Boot Camp. Right now, in the main menu, you will find a new option called “In-Game Manual”. 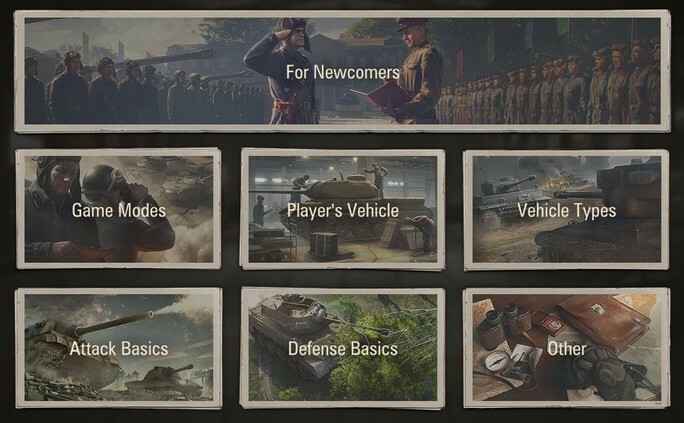 This is a collection of slides to explain some of the key features of World of Tanks: some of which are basic and some of which are a bit more advanced. EXAMPLE: Say you find yourself wondering which tank type is for you (or you’re looking at researching a new branch), you can check out the guide to give you a better understanding of what roles the tanks play through the course of battle. Even if you consider yourself a master tanker, it doesn’t hurt to take a look! For those of you new to World of Tanks or slightly inexperienced on the battlefield, we now have a selection of missions for you to complete to help you progress through the game and to teach you the basics so you can get the most out of your tanking career. Each mission is linked so completing the previous mission unlocks the next in the chain. Don’t worry, we aren’t expecting any superhuman results or accomplishments from you to complete them. Make sure to check out both of these new features with the latest update!